Lawrence Paul Lewis and Linda Hansen were recognized for their contributions to infrastructure security and nuclear nonproliferation, among others, at the U.S. Department of Energy (DOE) Secretary’s Honor Awards ceremony in Washington, D.C., on August 29. Lawrence Paul Lewis, leader of the Technology Implementation Program in the Decision and Infrastructure Sciences division at DOE’s Argonne National Laboratory, received the Secretary of Energy’s Achievement Award for his support of the Department of Homeland Security’s Office of Infrastructure Protection following the hurricanes that devastated Puerto Rico in 2017. His work toward long-term recovery planning included analysis of lifeline infrastructure systems (e.g., energy, water, communications and transportation) around Manati, Puerto Rico and identification of opportunities for long-term reinvestment strategies. This effort resulted in the development of a web-based geographic information system application that identified key infrastructure assets and their first- and second-order dependencies. 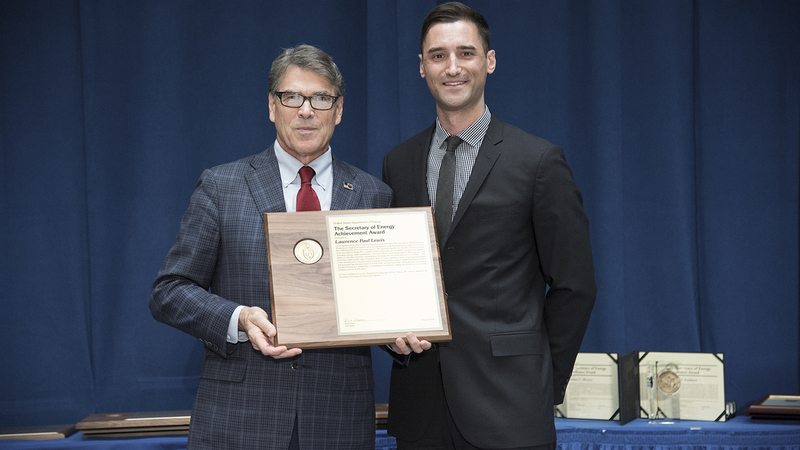 Principal Nonproliferation Policy Analyst Linda Hansen, of Argonne’s Strategic Security Sciences division, was also awarded the Secretary of Energy’s Achievement Award. DOE recognized Hansen for her exceptional service and leadership in support of U.S. initiatives to advance international adherence to the International Atomic Energy Agency Additional Protocol, a critical component of the international nuclear nonproliferation régime. Hansen’s work is sponsored by the Office of International Nuclear Safeguards/International Nuclear Safeguards Engagement Program. DOE bestows the Secretary’s Honor Awards on employees or contractors who accomplish significant achievements on behalf of the Department. Award recipients receive a certificate signed by the Secretary of Energy. The United States’ hypersonics program recently was reinvigorated, by both the threat of being surpassed by rival nations and increased investment by the U.S. Department of Defense to accelerate new innovations, including hypersonic technology. What if our military could dramatically reduce the amount of materials and equipment held on the front lines by printing only what they need?